A symmetrical, oval crowned Sugar Maple with dark green glossy summer foliage. One of the best Sugar Maples for drought and heat. Foliage colors late in the fall to a reliable orange-red. 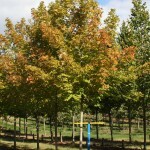 As with other sugar maples, it will grow best in well-drained, slightly acidic soil in full sun.